If the title of this movie interests you, I can almost guarantee you will enjoy the film to some extent. If, however, the name of the movie leaves you cold you might want to stay away. The title also appears rather redundant at first glance, but rest assured the filmmakers did not merely make an error in naming the film. Ninja Assassin contains a plot, but any sort of coherence is secondary in this film. The entire production is an excuse for slicing and dicing followed by copious amounts of CG blood. To this end the movie succeeds admirably. But there is a story, of sorts. We are introduced to the idea that there are nine clans set up as ninja training centers. They kidnap orphans and train them until they are well-toned, bloodied killing machines. Then, as they have been doing for centuries, the clans offer their services to governments and wealthy individuals or groups. The price of a man’s life remains constant: 100 pounds of gold. This small fact allows a forensic researcher at Europol, Mika (Naomie Harris), to discover a link between assassinations that have spanned hundreds of years. She starts developing a crazy theory that involves ninjas and a conspiracy. Her boss, Maslow (Ben Miles), is at first hesitant to believe her, but as the evidence builds he helps her investigate further. Until, that is, he discovers that this secret may go much deeper than he imagined, and that it may cost him his life. The plot concurrently follows the titular ninja assassin. 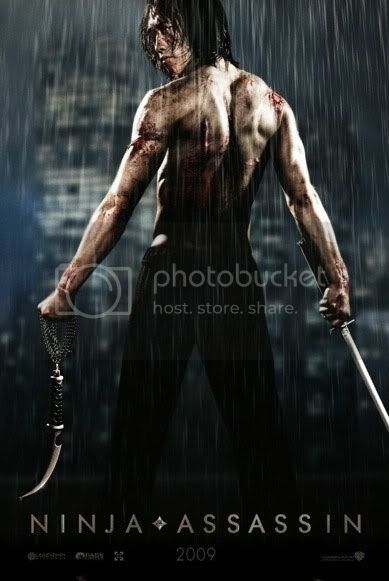 Korean pop-star Rain fills the shoes of Raizo, one of the most promising orphans in a clan. He grows up suffering much and inflicting much pain, fighting without remorse. He believes he has no heart until a young girl in the clan teaches him otherwise. She somehow survives the upbringing long enough to eventually refuse to harm another student, and consequences follow. Her fate puts the final touch on Raizo’s destiny, leading him to disown the clan and fight against their world-wide assassinations. I realize the plot sounds a tad ridiculous, and it is. Truth be told, the movie is not particularly good when ninjas aren’t fighting. When they don their black outfits and ninja weapons, however, the result is all-out action violence. Swinging katanas and daggers slice off limbs and shuriken fly with the rate of fire and impact of machine gun bullets to destroy a variety of cannon fodder. Swat teams, policemen, yakuza members, and fellow ninjas all fall to this dreaded arsenal. It doesn’t hurt that the ninjas also possess supernatural powers, able to rise from the shadows like spirits, heal themselves, and teleport to confuse and disorient their enemies. 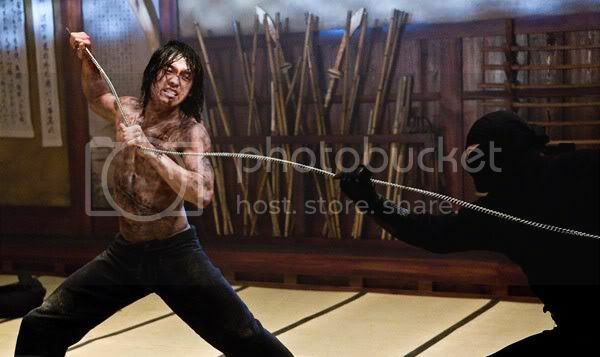 In a lot of ways, Ninja Assassin is a fusion of the Japanese samurai movies of the 1970’s and the recent gore/shock genre that Japan produces constantly. The blood is as absurd as Tokyo Gore Police and The Machine Girl, but without the viscera and brains those films delight in. Unfortunately, the English that the various ninjas speak do nothing to enhance the atmosphere. I wish it had been economically viable to subtitle their performances. The film delights in its action sequences, and they do not fail. With the Wachowski brothers producing and James McTeigue (V For Vendetta) directing there are some amazing operatic battles. 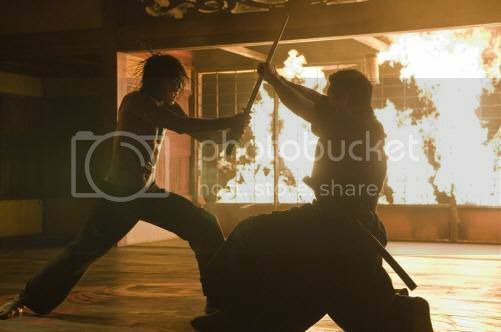 Ninjas fly and blood gushes to no end, though much of the action seems seems to be CG. However, any time the plot settles down and the characters talk and interact, the film plummets. The movie could have been twice as good (and half as long) if every part without ninjas had been excised. You probably already know if you will like the movie. If non-stop violence and bloodletting sounds good, you will be pleased. If you’re looking for a deep, engaging story and characters, look elsewhere. The film looks great, has very high production values, and contains practically every cliche involving cool ninjas and ultimate battles. I enjoyed the movie, generally speaking, as the violence is insane and can’t be found in much of American cinema. It isn’t a great movie, as I’ve already mentioned, but if the title sounds good to you I imagine you will enjoy it. This entry was posted in 2.5 stars, 3.5 pirate flags, Movie Reviews, N on December 5, 2009 by Tim Irwin.